For those who missed either of those reviews, and before I get on to describing the DB7, I’d better do a quick recap. Put simply, all speakers display phenomena, be they electrical or acoustic in nature, that result in a degree of in-out latency that varies with frequency, from single-figure milliseconds or less at mid and high frequencies, up to tens of milliseconds at low frequencies for some ported monitors. The idea behind normalising in the time domain is to apply DSP-based delay compensation selectively to slow the arrival of frequencies that would otherwise arrive at the ears ‘early’, so that the entire audible bandwidth arrives simultaneously. Many speaker engineers and audio-geeks, me included, believe such time-domain normalisation brings some significant subjective benefits (although there’s a similarly significant bunch of folk who are sceptical), although it also of course brings the disadvantage of potentially problematical full-bandwidth latency. Moving away from time-domain normalisation and back to focussing on the DB7 specifically, this is a relatively conventional-looking two-way, ported, active nearfield monitor with, as ever, its amplifier heatsink, connection sockets and controls located around the back. The connections fitted comprise a balanced analogue input (and output), a mains input and a couple of RS485 network sockets. 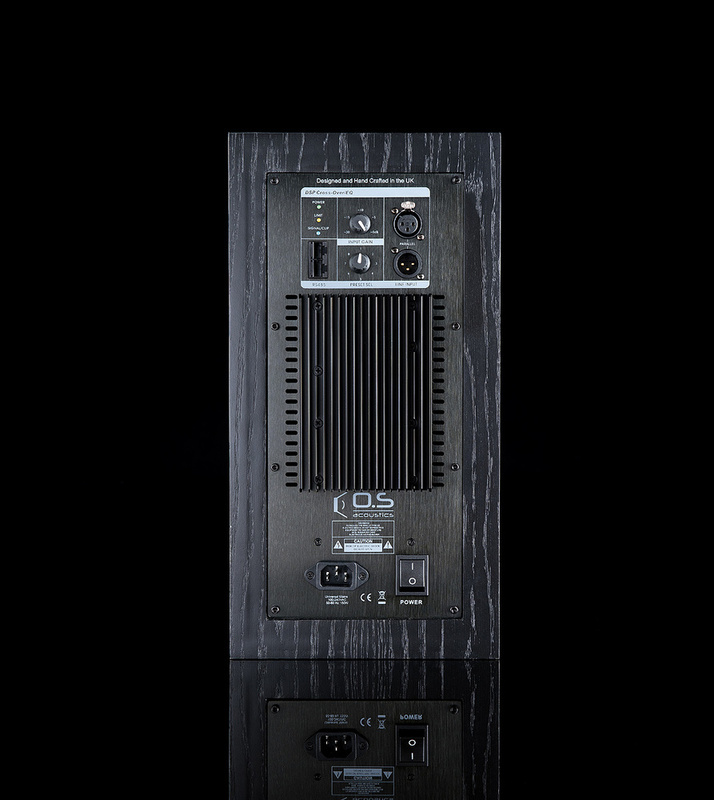 The RS485 sockets are present at this stage simply to provide diagnostic and firmware update functions but, according to OS Acoustics founder Tom Osborne, they may come into play with further connectivity in the future. Alongside the sockets are a couple of knobs: one that provides variable input gain adjustment and one that enables the selection of EQ and time-domain normalisation presets. My usual frustration with variable gain adjustment — that it’s not easy to be sure that both of a pair of monitors is at the same level — was eased by Tom’s assurance that variable adjustment will in future become stepped. And the presets? I’ll describe them fully a little later. The DB7’s rear panel.Heading back around the front of the DB7, the first thing perhaps to mention is that this is a relatively long journey because the enclosure is unusually deep. Tom explained that there are two reasons for the enclosure depth. Firstly, the internal enclosure volume required to enable the target low-frequency bandwidth to be reached without having the ports tuned too high meant that at least one dimension needed extending. And secondly, somewhat unusually, the DB7 electronics do not share the enclosed volume with the drivers and ports but are contained in a completely isolated space. This, to my way of thinking, is a good decision because many electronic components are inherently microphonic to a greater or lesser degree, and introducing some isolation that spares them from direct assault by the acoustic energy off the back of the bass/mid driver can only be beneficial. I’d happily pay for that with a bit of extra enclosure depth, although of course, seeing as I could make the DB7s fit either side of my workstation without any trouble, that’s easy for me to say. However, if by the end of this review you’re considering the DB7 as a possible option, do check the 44cm depth will fit your installation. The DB7 enclosure is conventionally manufactured in MDF with a profiled front panel that will help a little to reduce edge diffraction effects. Internally the enclosure is heavily braced with both multiple back-to-front struts and a single side-to-side block. The significant size of the side panels, each one being over 10 times the area of the bass/mid driver, means that it is crucially important that their potential contribution to the sound of the DB7 is kept to a minimum. To that end, the enclosure construction was developed using finite element analysis techniques and it certainly feels suitably rigid and non-resonant. Finally having made it to the front of the DB7, we find the expected couple of drivers arranged conventionally with the 25mm tweeter above the 140mm bass/mid driver. In common with countless other pro and hi-fi speaker companies, OS Acoustics don’t manufacture drivers but buy them from specialist suppliers. In the case of the DB7, the aluminium diaphragm bass/mid driver comes from the SEAS company in Norway (www.seas.no), and the tweeter, with its impressively high-tech ceramic-coated magnesium dome, from Eton (www.eton-gmbh.com) in Germany. But it’s not only the drivers that OS Acoustics purchase from specialist suppliers: the class-D amplifier also is an OEM component, this time from Pascal in Denmark. 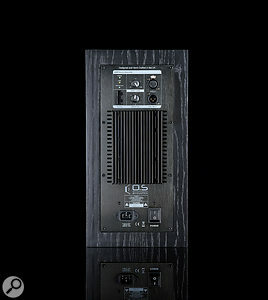 And speaking of the amplifier, it’s rated at 500 Watts (into 4Ω) for the bass/mid channel and 150 Watts for the tweeter. The 2.1kHz crossover is handled via the internal DSP module, which of course means that the DB7 internal signal path is fundamentally digital — there’s a 96kHz, 24-bit A-D/D-A round-trip between the analogue input and the power amplification. It seems to me that a digital input will make sense on a DB7 MkII should it appear over the horizon. There’s another feature on the front panel that I’ve not yet covered and that’s the DB7’s twin ports. Tom’s argument for twin ports (rather than one of the same total cross sectional area) is that, due to the unusually low tuning frequency, two ports are necessary to get the required area within the front panel real estate available. I’m not entirely convinced that really adds up though because, doing the maths, the diameter of a single port of the same cross-sectional area as the two summed (30.4cm squared) would be 6.2cm, which would seem to be feasible on the centre line of the front panel. This is mildly significant because the losses inherent with ports in terms of the various distortion, unwanted resonance and compression effects they can introduce will express themselves ‘per port’. So to my mind, a single port is a lesser evil than two. Having said that, the DB7 ports are tuned low at 43Hz and are relatively free, as illustrated in Diagram 1, of major ‘organ-pipe’ resonance problems. They’re also reasonably flared at both ends, so there exists a distinct possibility that I’m just being a bit picky. Diagram 1: The output of the DB7 measured at one of its ports. The port tuning is fairly low, at 43Hz, and there are no significant ‘organ pipe’ resonances.On the subject of ports, however, I do find it interesting that on a monitor in which time-domain normalisation is a fundamental element, a ported low-frequency system, which will inherently have higher group delay, is chosen over the more ‘benign’ closed box. I put this to Tom and while he agreed that closed-box loading, with its inherently lower group delay, is attractive, he felt that, considering the relatively compact scale of the DB7, the compromises necessary in terms of low-frequency bandwidth, low-frequency power handling and mid-range intermodulation distortion (see ‘Intermodulation Distortion’ box) would be too great. In a second box, I’ve used the example of the DB7 to examine more closely some of the characteristic differences between ported and closed-box loading. Diagram 2: The DB7’s frequency response in its flat (orange trace), voiced (green) and boundary-corrected (purple) modes.I’ve illustrated the flat response (orange), voiced response (green) and room boundary corrected response (purple) in the FuzzMeasure curve in Diagram 2. The flat response of the DB7 appears suitably linear with no obviously significant features, and the room boundary correction, as expected, provides a few dB of attenuation from 500Hz downwards, but perhaps the most significant curve is the voiced response. The result is significantly more mid-range level and a degree of attenuation in the presence band. The intention behind the voiced response, as Tom Osborne explains it, was to provide a more relaxed balance for less-critical listening, and it certainly does that, but to my ears it’s possibly a little overcooked to be useful in a monitoring context. I’ll move on shortly to describing more fully my thoughts on the subjective performance of the DB7, but there’s a more technical aspect to cover first. Diagram 3: The DB7’s impulse response, both with and without time-domain correction (orange and teal, respectively).Along with producing frequency response curves, FuzzMeasure can display time-domain data, and it reveals quite clearly in Diagram 3 how time-domain normalisation cleans up the DB7 impulse response. The orange curve shows the impulse response with the ‘flat’ preset selected. The two separate arrivals from the tweeter and then the bass/mid driver can clearly be identified. The green curve illustrates the same flat frequency response but with time-domain normalisation engaged. The much tighter impulse is obviously apparent. The second thing that’s obviously apparent is that time-domain normalisation results in 5ms of extra latency (the 4.5ms of latency on the orange curve is the sum of the DAW interface latency and the signal ‘flight time’ between monitor and measuring microphone). So, on to listening. As usual, with the DB7s setup either side of my DAW, I began trying a few well-known pieces from a variety of sources. I also had the DB7s, as is often the way, playing various Spotify streams in the background while I worked. First impressions, with the conventional ‘flat’ preset selected, were of a slightly bright, mid-emphasised and analytical balance with a very low level of tonal coloration and a notably open character. Stereo imagery was sharply defined with a good degree of depth. From the first few moments it was clear that the DB7 is fundamentally a very capable monitor. Interestingly, the SEAS bass/mid driver fitted to the DB7 is, I believe, from the same range as the bass/mid drivers fitted to the Amphion monitors, and it displays a similarly explicit nature that’s well suited to monitoring. It’s sometimes not the most relaxing of characters, but it works well in context by revealing low-level details and helping untangle different strands of a mix. Bass from the DB7 was a little overblown in terms of level in my room, until I engaged the room boundary compensation preset after which its level sat much better within the overall balance. The low port-tuning frequency of the DB7 helps it avoid a really obvious ‘ported monitor’ character but, to my ears, it still misses out slightly on an element of integration of transient and sustained low-frequency mix elements. The smack of a kick drum isn’t quite connected to the ‘woomph’ of its body, for example. Having said that, this character of nearfield monitoring is something that we’ve all become adjusted to, and the DB7, in the grand scheme of things, is as good as (and in a lot of cases probably better than) many other monitors out there. I hanker after a closed-box version of the DB7 but I also appreciate that such a thing would require a significantly more heavily engineered and expensive bass/mid driver (or two). At the other end of the audio bandwidth I have no complaints at all. The Eton tweeter is clearly a good one that combines a satisfying degree of high-frequency detail with an easy-going and untiring nature. It seems to me that the basic architecture of a successful tweeter is pretty well established these days and it’s getting increasingly difficult to find a genuinely poor one. Go back a couple of decades or more and there were some tweeters around that managed the unlikely trick of drawing attention to themselves while at the same time being genuinely difficult to bear over extended periods, such were their levels of distortion and coloration. Those days are past now, and the Eton unit of the DB7 is a good example of how tweeter design has moved on. My only question would concern thermal compression. The crossover frequency of the DB7 is relatively low (2.1kHz), which means the tweeter works relatively hard. This, however, tends to be a character of many two-way monitors and is not by any means exclusive to the DB7. It’s simply one of the two-way compromises. And so to the really interesting element of the DB7: its time-domain normalisation. As I found with the HEDD Type 20 previously, switching between a conventional preset and a time-domain normalised one doesn’t result in an immediate, chin-dropping, night-versus-day revelation. The difference is apparent predominantly in terms of stereo image depth and focus. However, listening over the longer term I began to notice an increased sense of clarity in the way elements of a mix are presented. It’s as if the spaces between elements are enlarged. And switching back to the conventional preset after a period listening in time-domain normalised mode results in a sense of a mix collapsing back into a smaller aural space. It’s still a relatively subtle effect, but it becomes more significant the longer you experience it. Ultimately, I stopped listening to the DB7 in conventional, non-time-domain compensated mode, which perhaps is all that needs to be said. If you’re going to launch a new monitor into an over-crowded and hugely competitive market it had better bring something unusual. This is especially so if you’re a new company with limited resources. In those terms, OS Acoustics have done exactly what’s needed to be noticed and to make a success of their efforts. 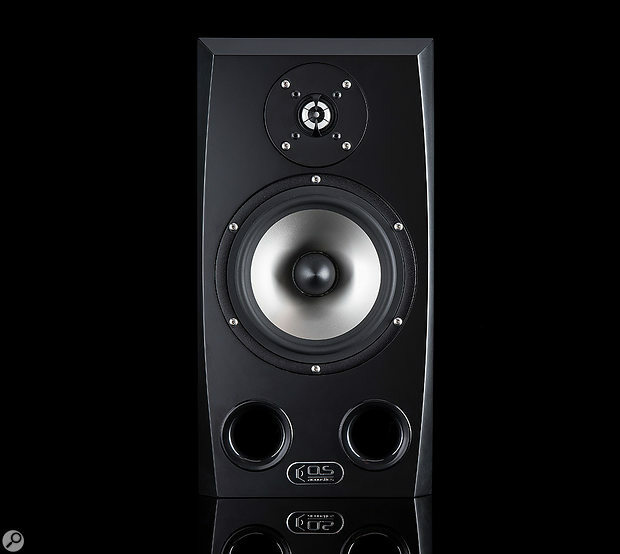 The DB7, even without its time-domain normalisation, is a fine monitor that takes some high-quality components and presents them in a well-engineered and professional system. I haven’t included a pair match measurement in the review but I did check it, and the two monitors were matched to well within 0.5dB over the full bandwidth. That speaks volumes for the care with which the DB7 is manufactured. Add the benefits of time-domain normalisation and the arguments for the DB7 become yet stronger. There’s something of the ‘usual suspects’ about this list, but the DB7 has landed in an extremely competitive market segment inhabited by numerous fine products such as the HEDD Type 20, the Neumann KH310, the PSI A17‑M and the Genelec 8350. I mentioned in the main body of the review that one of the potential issues that drove OS Acoustics towards a ported design for the DB7 was mid-range intermodulation distortion, and it occurred to me that the mechanism behind that phenomenon, and why a port might help, is maybe not obvious. Intermodulation is a particularly insidious variety of distortion because it has no harmonic relation at all to the input signal. I’ve mentioned it in a couple of recent reviews in the context of dual concentric compound drivers. Put simply, it occurs when a higher frequency is modulated by a lower one. So, imagine a bass/mid driver pumping vigorously back and forth at, say, 50Hz while simultaneously reproducing a 1kHz tone. From the listener’s point of view, the source of the 1kHz tone is effectively moving back and forth at 50Hz and consequently its frequency will vary. Analyse the audio at the listening position and you’ll see fundamental signals at 50Hz and 1kHz with intermodulation side-bars at 950Hz and 1050Hz. And the reason that this effect is reduced on port-loaded speakers is simply that the action of the port is significantly to reduce driver diaphragm movement around the port tuning frequency. This phenomenon is illustrated in the ‘Bass Loading Options’ box. Diagram 4: A simulation of the low-frequency response of a ported (left) and unported (right) speaker, using the same driver and enclosure volume in each.The comment from Tom Osborne of OS Acoustics that a closed-box loading option for the DB7 brought with it too many compromises set me off to illustrate some of the options theoretically available from the use of the same SEAS bass/mid driver in a similar-sized enclosure. I used a free online speaker simulation app called SpeakerBuilder Pro 2.0 (http://sbp.softica.dk/2.0/en/) to generate the data. I’ll include a couple of the resulting graphs here but the full set would consume too much space so I’ll put the rest up on my blog (musicandmiscellany.com). Diagram 4 shows the simulated frequency response of the ported and closed box of the same volume, both with the same SEAS driver as is fitted to the DB7. It’s obvious that the ported option results in significantly extended low-frequency bandwidth (although, below 40Hz, the closed box actually beats it for level). Diagram 5: Driver excursion in a ported (left) and unported (right) enclosure.Diagram 5 shows a comparison of the bass driver cone movement (excursion is the technical term) for the same volume level (with an ‘X-Max’ dotted red line showing the limits of excursion linearity). Again, around port resonance (43Hz) the ported option has benefits because it requires the driver cone to move less, and if you imagine the scenario of selecting the closed-box option but then using equalisation to extend its bandwidth, you can perhaps see that the bass driver will very quickly run out of linear excursion. 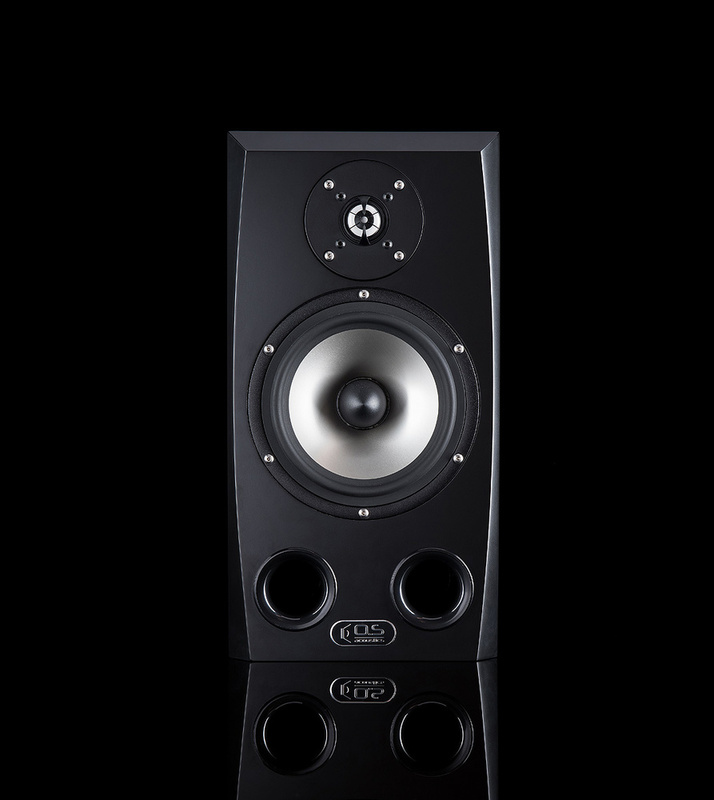 The comparison of driver excursion also illustrates why so many active ported monitors (DB7 included) incorporate high-pass filters just below the port frequency: to restrain the potential for exaggerated and potentially destructive cone excursion at very low frequencies. One reason why, back in the (first) days of vinyl, closed-box hi-fi speakers rather than ported were the norm, is that a closed box provides driver excursion restraint at the very low frequency of record warps. A warped record could be all but unplayable on a ported speaker. Well engineered with quality components. Great basic performance with good tonal balance and great stereo. Time-domain normalisation adds an unusual extra appeal. The DB7 is a great start from OS Acoustics and it’ll be fascinating to see if the company can fully establish themselves in the monitor market. More pertinently, however, the DB7 from my point of view falls firmly into the ‘must hear’ category. £2998 per pair (approximately $4121).